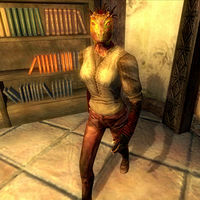 Mach-Na is an Argonian merchant at Mach-Na's Books in Cheydinhal. Mach-Na sells books and offers basic training in Mercantile. The unique Chronicle of Sacrifice can be purchased here and nowhere else. For some reason, Cheydinhal citizens refer to her as a grumpy old man. Despite her questionable reputation in Cheydinhal, Mach-Na works hard in her bookstore every day of the week; after a six-hour sleep, she gets out of bed at 6am and spends a few hours on the ground floor before she unlocks the door for customers at 8am. After 12 hours of services, she locks the door at 8pm and spends the rest of the evening wandering around the main trading room until her bedtime at midnight. She wears a set of lower class clothing: a coarse linen shirt, laced leather pants with a pair of rough leather shoes. She carries her key, the security skill book Advances in Lock Picking and a small amount of gold. She greets her customers in a very to the point manner: "Books. I sell books. Go ahead. Look. Buy some." If her Disposition towards you is at least 50, asking Mach-Na about Cheydinhal will cause her to share some personal opinions with you: "Imperials hate Dark Elves; Dark Elves hate Imperials. Imperials hate that a no-name Hlaalu trader got made into a count. Andel Indarys doesn't help his case by having a prat for a son, and a wife that dies in very suspicious circumstances. Our Dark Elves left Morrowind to get away from the Church and State, and they don't like it when Imperials get all holy and patriotic with them. Of course, local Dark Elves tend to be money-grubbing, alcoholic low-brows with little education or culture. Since I read a lot, and speak well, and don't drink brandy from milk pails, I guess I qualify as an Imperial. But on the whole, I like Cheydinhal's Dark Elves better than I like the Imperials, so go figure...."
The people of Cheydinhal all seems to have the wrong impression of the busy Argonian; not only will they all mistakenly use male pronouns (see bugs), they will also refer to her as grouchy and surly: "Mach-Na runs a good business. He's a grumpy old man, though. ", "There are some quality books at Mach-Na's. Just don't catch him when he's in a bad mood. ", "I've bought a few things at Mach-Na's, but he's always so surly. ", "He runs a nice store, but Mach-Na is a grouchy old man." Other citizens will be more forgiving and ask: "Have you ever shopped at Mach-Na's Books?" and "Don't you think Mach-Na runs an excellent bookstore?" In the Imperial City, bookstore owner Phintias will recommend Mach-Na's bookstore as well: "This is the only book store in the city. There's also Renoit's Books in Chorrol, Mach-Na's in Cheydinhal, and Southern Books in Leyawiin." The townsfolk of Cheydinhal and the Guide to Cheydinhal refers to Mach-Na as being male.